20 Years Later, Does ‘Office Space’ Still Roast the Modern Workplace? The Gen X comedy still has laughs amid a changing professional world. Movies become classics for different reasons. Mean Girls is quotable and The Hangover keeps you guessing. Since its release in 1999, Office Space has endured as a cult hit because so many people have seen elements of their real-life careers played out on the screen. All of us endure mind-numbing tasks for a paycheck at some point, but Office Space‘s Gen X protagonist Peter is trapped in something of a corporate time capsule. His work life is chained to the 1990’s management trend that all jobs could function as cogs in an assembly line, which turned many professional environments into labyrinths of paperwork and terminology a la TPS reports. With his soon-to-be partners-in-crime, Michael Bolton and Samir, Peter attempts to duck his socially inept boss Lumbergh and waste as much time as possible. Peter, Michael and Samir work like rats in a maze with no cheese at the end. They shuffle through each day at Initech and attempt to avoid being noticed enough to be assigned extra work or get fired. Does the World of Office Space Still Exist in 2019? Office Space writer/director Mike Judge has an incredible gift for catching a cultural moment and skewering it until there’s nothing left to satirize. He entered the pop culture lexicon with MTV’s Bevis and Butthead in 1995, and today, he leads the HBO smash Silicon Valley. Judge’s resume proves he’s a barometer for the ridiculous things we accept as normal. 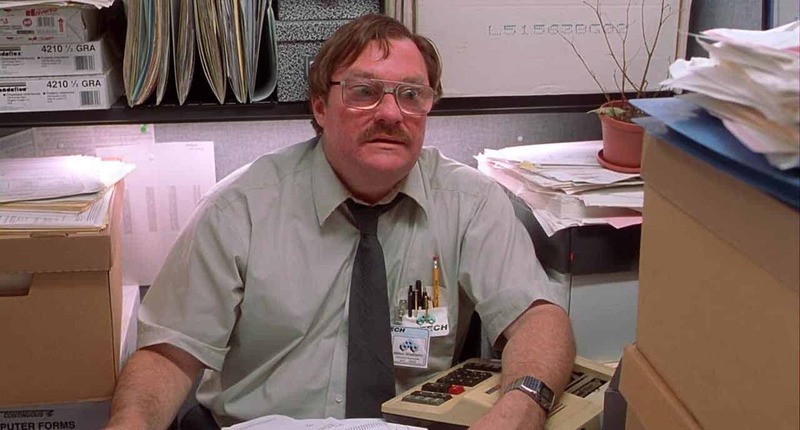 Similarly, Office Space shows how the working world has changed by how much the working world of the movie has aged. The odds that you’re going to watch Office Space in 2019 and see your job and your boss in the story have gone down significantly. And that’s a great thing. Exasperation toward incompetent management and laborious tasks will play well with pencil-pushers from any time, but Office Space is still funny because you can relate to the setup more than the punchline. Let’s start with Joanna, a weary twenty-something slinging burgers and fries to the local corporate crowd. She faces the dual frustrations of having to add more accessories to her server outfit and the dolt of a boss who wants her to be happy about it, as if Joanna’s internalized feelings about her uniform would affect company profits. This conflict is the perfect skewering of a professional era when almost every company was adorned with motivational posters of group skydiving and some pithy cliche about teamwork. The 90’s weren’t just a time when companies expected you to work hard, management trends also demanded you appear to enjoy yourself while trudging through pointless tasks. For workers like Joanna who were trying to earn a living without a college degree, there was often little choice but to slap on a fake smile and endure verbal assault over details that didn’t matter. Nowadays, chain restaurants in the style of Chotchkies have fallen out of favor with millennials, but more so, food service workers have more options for career advancement now than any other point in the history of dining out. Chipotle, Starbucks, In-N-Out, Five Guys and Shake Shack all offer different combinations of free college tuition, strong insurance benefits for part time workers, paid sick leave and compounding vacation time. Plus, many of these companies promote from within, making the path from burrito stuffer to multi-restaurant manager (and the latter’s competitive salary and company car) a viable option. This means companies who belittle and mistreat their entry level employees are in real danger of losing those workers to a better opportunity. In the 90’s, those options didn’t exist. This alone takes Office Space further away from “fictionalized workplace documentary” and closer to plain old screwball comedy. The good news is, these days you’re also less likely to find yourself in a career quagmire like Peter, Samir and Michael Bolton. According to management consultant Haydn Shaw, who’s worked with over 1500 companies on retaining employees, bosses aren’t as likely to act like Lumbergh in 2019. Gen X-ers and millennials are much more willing to leave bad situations for greener pastures, Shaw explains, referring to a Forbes study that found millennials job hop more than any previous generation. “Biannual cultural surveys make it difficult for the horribly incompetent managers to create that kind of wreckage,” he says. That’s not to say modern work has entered a utopian state, of course. Abusive workplaces, as #MeToo indicates, certainly still exist. A big reason Office Space has remained a fun watch is the fantasy of creating an elaborate plan to stick it to the boss and/or company who hurt you. The movie’s a white collar revenge fantasy with a lot of jokes thrown in, but even this element of Office Space has passed its sell-by date. In the world of Office Space, the only way to “stick it to the man” is to take from a company what it values most: profits. But losing money isn’t a permanent consequence. Most companies lose money without any sabotage before making it back later. Today, as we’ve seen carried out in Twitter innumerable times over the past year, someone’s reputation is a far more potent target. Last year, Uber lost 20 percent of its estimated value in part due to the New York Times breaking the story of widespread sexual harassment inside the company. On paper, Uber lost $21 billion in less than a month. A modern Office Space remake would likely involve Peter, Michael Bolton and Samir organizing a slew of falsified emails, planted data and doctored photos. Given the relative ease one can whip multiple segments of the American public into a frenzy, a fake scandal would be the most convenient and effective way to administer vengeance against an employer. That’s not an endorsement. It’s just a fact. Two decades later, Office Space still holds its own as a comedic gem. There’s a reason it achieved cult classic status. Thankfully, art is less likely to mirror reality in the 20 years since Mike Judge set the world on fire with a screwball comedy pointing out the absurdities of modern employment. Work is better now. And even when it isn’t, we have a lot more options to take our talents somewhere else. Just feel free to pack up the Red Swingline stapler when you clear out your desk.